Most Americans have a compromised Immune System. Most also have leaky gut. If you have allergies, get frequent colds, ear infections, are overweight, have arthritis..you have leaky gut. Healing a leaky gut means following a nutritional protocol to enable it to heal. Replenishing gut bacteria is crucial; to heal the lining of the stomach, to properly digest foods so that you can actually absorb the nutrients…in order to repair the immune system and enjoy optimal health. One way to do this is to take probiotics, but they are very pricy and do not really survive the stomach acids to get into the colon where they will do you the most good. Eat fermented foods! Sauerkraut, wine, pickles, coconut milk yogurt (you should avoid dairy in all forms for optimal health), and Kombucha tea are great ways to do this. I began fermenting Kombucha tea about a year ago, it is easy and fun to make…and is very inexpensive. I also now make my own organic Apple Cider Vinegar. Beginning next week I will begin selling Kombucha tea with my other Culinary Items. 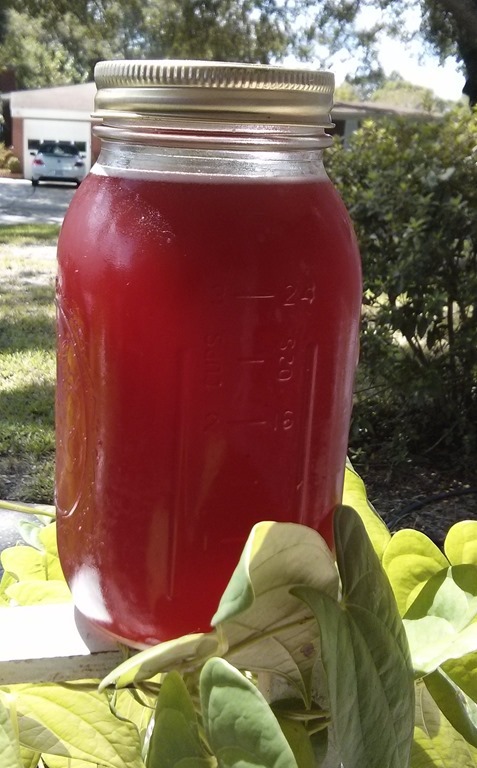 I make a mild, very slightly sweet Raspberry Kombucha. It will be on the menu each week. I am SO excited about the response to the RAW JUICES we are now delivering! They are made early on the morning, chilled quickly before they go out the door for delivery. Beta-C- carrots, celery. 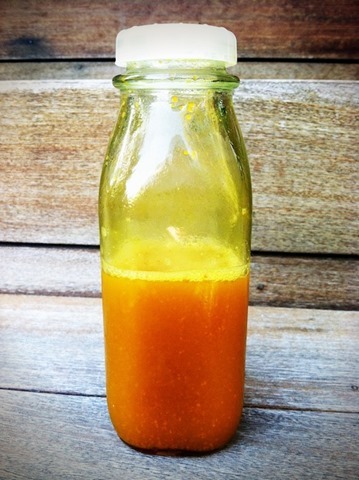 green apple, ginger, turmeric, lime. Happy Greens- cucumber, celery, baby kale, spinach, parsley, lime. Our juices are made the from all organic ingredients, made the day they are delivered, refrigerated immediately and delivered in glass jars. These are returned on the next delivery. Benefits of Juicing- Juicing offers many health benefits including a faster, more efficient way to absorb immune boosting nutrients naturally found in fruits and vegetables. It provides a way to access digestive enzymes typically locked in the fiber of whole fruits and vegetables. It’s best to drink juice the same day they are made. As soon as any juice meets the air it begins to oxidize, compromising its nutritional value. 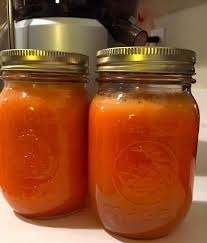 However, storing our full juices in the refrigerator in a tightly sealed glass jar slows this process. The best time to drink juice is on an empty stomach or at least an hour before eating a meal. This maximizes the amount of nutrients absorbed into the body. Of course, fresh pressed juice is still loaded with health benefits even if you can’t drink it during the recommended window. Juicing and Illness- There is lots of research that shows the healing properties of juicing. 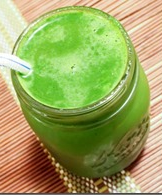 Juicing aids weight loss, brings increased energy levels, strengthened immunity, and helps build strong bones. It also helps prevent and heal heart disease, cancer and strokes, three of the leading causes of death. A growing body of research suggests that most vitamin supplements don’t help prevent chronic disease. A synthetic vitamin or mineral is a laboratory simulation of the real thing. Natural, plant-based vitamins and minerals are more easily and completely absorbed by the body. I grind mine at this point in a coffee grinder. You could use a mortar and pestle. Place all of the ingredients in a large glass jar and stir to combine. Cover tightly and let sit at room temperature for 2 days. Remove the plastic wrap and transfer the mustard mixture to a blender. Blend until the desired consistency is reached, about 30 seconds for a coarse texture. (Keep in mind that it’s not possible for this mustard to reach a completely smooth consistency.) Transfer the mustard to a small, nonreactive container with a tight fitting lid, cover, and refrigerate for up to 3 months. I was at Grassroots Natural Market in 5 Points this morning and Caren Burmeister was there doing a demo of her all natural skin care products. Driven by an abiding respect for Mother Nature and a deep curiosity, Caren spent hundred of hours researching plant-based ingredients that are potent, safe and beneficial. With those premium extracts, she handcrafted rich formulas that moisturize the skin and make it softer and more youthful looking. Wanting to help others achieve the greatest skin possible, she turned her passion into a business. I was quite impressed! Her products have very clean ingredients and she has really done her research in essential oils that are beneficial to the skin. I tried the Cranberry Nectar,a light, botanical blend absorbs quickly, reviving wrinkled and sun damaged skin. Cranberry seeds are concentrated with antioxidants, essential fatty acids and Vitamins E, A and K. I found the products to absorb quickly, feeling very light on the skin. 4 hours later the skin on the back of my hand still feels very soft…moisturized but not oily. In my long quest to eschew plastic, I began purchasing recycled toothbrushes..about 8 years ago. I enjoyed the Reach toothbrush, but they are expensive, and are still plastic. Even cycled plastic is not what I want to buy or use in my home at all. So I have stuck with the toothbrushes will recyclable heads.. I also tried Neem sticks, twigs that you chew and then brush with. While i LOVE Neem tooth powder…these just didn’t cut it for me! I am drawn to the fact that they are primitive, cheap. renewable, compostable. After all, I love doing things in their most basic forms; papermaking, soap making, cooking (making everything from scratch! ), weaving, spinning.. BUT, these were too primitive. Brush with Bamboo’s starter pack includes 2 toothbrushes. Our bamboo toothbrush is the environmentally conscious choice for your household. This toothbrush has a biodegradable handle made from 100% bamboo. The soft bristles are verified BPA-Free Soft Nylon (recyclable, not biodegradable). The bamboo toothbrush comes in a biodegradable box made from paper. The inside wrapper is made from plants and is compostable in city and commercial facilities. Your bamboo toothbrushes can be used for just as long as plastic toothbrushes. HERE’S where to buy them! I have been using turmeric for a while as an immune system builder. A client wrote me recently to tell me about this drink she had in Bali, and wanted to know if I could make it for her. I made a batch this week and really love it; it’s refreshing and healthy! You can order it from the Beyond-Paleo webpage! Turmeric is known to be one of the most powerful healing herbs. It is great for bones and joints as it has anti-inflammatory properties. It prevents metastases from occurring in many different forms of cancer. Boosting Immunity – Curcumin has a huge therapeutic value and boosting immunity is one of the most important properties of curcumin. “5 to 8 times stronger than vitamin E and stronger than vitamin C, this antioxidant breakthrough may help boost your immunity, maintain normal cholesterol levels, and put the brakes on aging,” says Dr. Joseph Mercola about the curcumin in turmeric. Anti-inflammatory and Anti-oxidant Property – Free radical causing oxidative damage of DNA and proteins are associated with a variety of chronic diseases such as cancer, atherosclerosis, and neurodegenerative diseases. Curcumin plays an important role in curbing these conditions. Curcumin Prevents the Development of Type 2 Diabetes in people who have prediabetes. Turmeric Improves Rheumatoid Arthritis, according to a study by Chandran and Goel at Nirmala Medical Center, Kerala. The researchers also found that curcumin treatment was safe and did not relate with any adverse events. Curcumin in turmeric has a potential role in the prevention and treatment of Alzheimer’s disease, according to a study published in the Annals of Indian Academy of Neurology. Researchers from Cancer Biology Research Center, South Dakota, claim that curcumin may be an effective chemopreventive and therapeutic agent for cervical cancer prevention and treatment. They found that curcumin treatment suppresses cervical cancer cell growth by altering the HPV-associated molecular pathways in cervical cancer cells. While lemon composes of citric acid, tamarind is rich in tartaric acid. Tartaric acid gives a sour taste to food but is also a very powerful antioxidant. (Anti-oxidant E-number is E334). It helps the body protect from harmful free radicals. Tamarind fruit contains many volatile phytochemicals such as limonene, geraniol, safrole, cinnamic acid, methyl salicylate, pyrazine and alkyl­thiazoles. Together these compounds account for the medicinal properties of tamarind. This prized spice is a good source of minerals like copper, potassium, calcium, iron, selenium, zinc and magnesium. Potassium is an important component of cell and body fluids that helps control heart rate and blood pressure. Iron is essential for red blood cell production and as a co-factor for cytochrome oxidasesenzymes. In addition, it is also rich in many vital vitamins, including thiamin (36% of daily required levels), vitamin A, folic acid, riboflavin, niacin, and vitamin-C. Much of these vitamins plays antioxidant, and co-factor functions for enzyme metabolism inside the body. Turmeric’s also a natural liver detoxifier and a kidney cleanser, and it speeds metabolism and aids in weight management. Plus it heals and alleviates conditions of depression, psoriasis, damaged skin, and arthritis. 1. Gently scrub turmeric root, there is no need to peel. 5. Go back to the turmeric water. By now, the color should look ready. Pour a little bit of cold water to lower the temperature. Take the turmeric water and pour it into the blender with the turmeric. We boiled it so the root could soften and have more flavor, now it’s ready to buzz in the blender for even more flavor and richness! Blend, blend, blend. The color now should look like an extra extra fiery marigold. 6. Go back to the tamarind in the pan. Pour substance into the strainer that is placed on top of a small bowl to catch the tamarind. Swish the jam like substance around in the strainer with the wooden utensil– we only want to use the soft bits of the fruit. No seeds, no seed peels. 8. Squeeze your lemons into the blender. Now take the blender and pour your yummy juice into your mason jar(s). Add honey to taste, close with lid, shake it up to mix. If you’ve been reading my blog for awhile you know I am very supportive of companies that are ethical, carry products I use and like and offer great customer service. In this post I am going to review a company who I had a horrible experience with, and tell you why you should not support this company or buy their products. It all started on July 9th when a friend told me she had given my name and number to a salesperson. I wasn’t thrilled, but dearly love this friend, so I thought I’d see what it was all about. A few days later a young woman called to try to set an appointment with me. She arrived and told me that she was selling Cutco knives and that she was trying for a scholarship and that simply listening to her spiel would give her points she needed, whether I bought anything or not. I listened. After about an hour of her over-the-top, these-knives-are the best-in-in-the-world monologue…I was over it. I got her to cut to the chase, and she made me an offer. I declined. I want to interject here that I’m a hard person to sell to. I’m a great salesperson, have taught sales, made a living at sales. Each time she led me with questions, each time she tried to close the deal, I kept pushing back. It irritated that she was trying to teach me things that weren’t true ( I’m a CHEF! ); that wooden handles on knives were unclean and dangerous (not true), that wooden cutting boards were unsafe (not true, a properly maintained cutting board is far safer than plastic, it doesn’t get nicked and has naturally occurring oils that are anti-bacterial). Finally, I chose three items I really did want and need, we negotiated, and I placed the order. I paid in cash, owing two more payments, she gave me a receipt. She told me that the knives would take about two weeks to get to me and that the other two payments would be due a month apart. When I asked her why it took so long she explained to me that these knives, my knives, were not simply sitting in a warehouse, they were made just for me. I had trouble not bursting out laughing! Right! So two weeks later the day came and went when I was supposed to get my knives. I went on the website to check the order status and it said pending. I texted the rep who sold me the knives and she txted me back to “not worry” and stop “stressing”. I let her know that I was not stressing or worried and that she had not answered my questions. The next morning, Monday, I called the company to check. They explained to me that my order had never been placed, that they never received the order or my payment. They assured me that the order was now placed and I would receive my knives no later than the following Friday. I didn’t. I called. They claimed that they had tried to reach me. They hadn’t. They went on to explain that they needed me to give them a credit card number because they could not accept a money order. I told then no way would I pay two payments at once, that it was not what I had agreed to. They said the person who had sold me the knives hadn’t put the order in, that she had given me the wrong info and that she had used the wrong form to place the order. I explained to them that THEY placed the order over the phone, that they had never received they order from her when I placed it. I also explained that well BEFORE I was promised those knives (in fact they promised that they were air fighting them to me over night)…they should have made sure everything was correct, that I had NOW SPOKEN TO five PEOPLE WHO WORKED FOR THEM AND NOT ONE PERSON HAD TOLD ME ANYTHING THAT WAS TRUE… and I STILL DID NOT HAVE MY KNIVES. The rep then txted me begging me not to blame the company, that it was her mistake…but if I went ahead and got the knives she would make sure that I was only billed once and in order to show me how bad the company felt over the whole mess that they would give me…FREE SHIPPING!! Too little, too late. I will NOT support a company who has no idea how to place an order, couldn’t care any less about customer service and lied…over and over. Further Googling led me to the many unhappy employees and customers who have put in complaints all over the INTERNET. 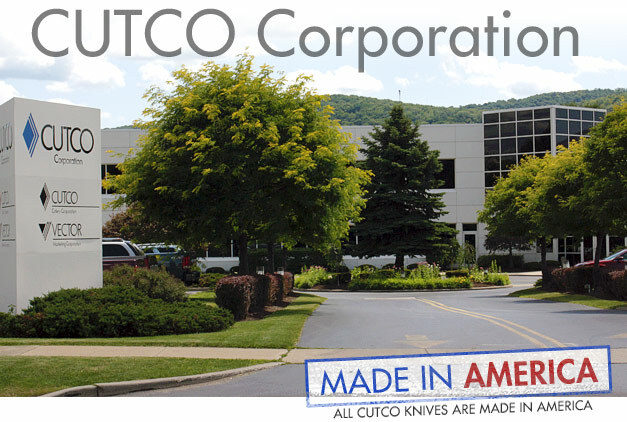 The Complaint Station, a Web site where consumers can post messages with concerns regarding a product or company, has logged more than 2,000 complaints against Vector Marketing and Cutco. An online group called Students Against Vector Exploitation, or SAVE, has an online petition against the companies with almost 3,000 signatures since it began last year. Vector has settled several wage claims that were filed at the Oregon Bureau of Labor and Industries last year, although it did not acknowledge any law violation. A Marion County court ordered Vector to stop deceptive recruiting practices as a result of a 1994 investigation. Most of the complaints refer to recruiting ads, long hours of unpaid training, work pressures and ethical concerns within the firm. Here are a few- Better Business Bureau – This is a customer complaint list.